Pros - Approximately 1.5 hours of guitar instruction - blues lessons within the context of Mustang Sally, Marty talks about how he sets up his electric guitar and amp. breaks the song down into three parts - chords (if you're playing solo), alternative rhythm (for another player) and then melody/licks, briefly discusses theory and 1-4-5 chords, shows substitution chords for C7, F7 and G7 - example would be 9th chords (C9, F9, G9), forming chords on the E root versus on the A root string, arpeggios and picking out notes of the chord, how to combine shapes from Part I and Part II while playing Mustang Sally - really useful exercise for all types of rock and rock/blues songs, octaves - how they work for this song using bass notes, licks from the pentatonic scale, long jam track to practice everything you learned. Cons - Would have been nice to hear the complete original song to practice along with on the DVD versus the jam track, Marty used an electric guitar and I played along with an acoustic - some of the lick bends were a little difficult on my acoustic, so I would suggest using an electric guitar for this lesson, if possible. 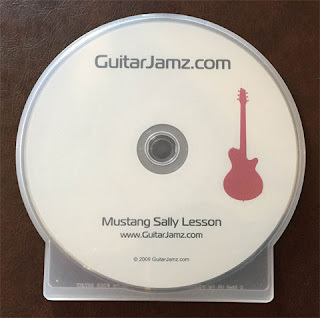 The Mustang Sally Lesson DVD was included in my purchase of Marty's Guitar Coaching Club. It's one DVD and focuses solely on playing the song Mustang Sally, however the principles learned can certainly be applied to other songs. I enjoyed how Marty broke down each part of the song slowly. I found it interesting that the E root power chords used (C7, F7 and G7) can sound so different depending on the rhythm used. I also liked that Marty took the time to go over his electric guitar settings to help players achieve the same type of tone on their instrument - even though I used an acoustic guitar. This attention to detail is why I like Marty's lessons so much. I also liked his message of playing with other musicians to help you improve. I can see someone learning from the Mustang Sally DVD and then teaching another player or two the others parts in order to all jam together - especially since it's such a catchy tune. Overall, I enjoyed learning this classic song with Marty! Mustang Sally was first written in 1965 by Mack Rice and gained greater popularity through Wilson Pickett, recorded a year later. It was a huge R&B hit that is still played all over the world today. It was fun to see how Marty breaks it down with his style of teaching. I really liked the 1-4-5 chord substitutions as well as the licks taught in this lesson. Finally, it was fun practicing it all together with Marty playing the jam track. If anyone has any questions about Marty's Mustang Sally DVD Lesson, leave a comment and I'll get back to you. Are you ready to learn Mustang Sally with Marty?